And it is this possession that the newly ordained Father Cardona so desires. “I want to be like the lamb, to pour myself out for love of the people, for the salvation of souls…,” he exclaimed. Reflecting on Romero’s life, Bishop Noonan noted, “Being chosen by God is not easy”—a reference to the archbishop’s martyrdom. Bishop Noonan appointed Reverend Edwin Cardona as parochial vicar of Basilica of St. Paul, Daytona Beach, effective September 7, 2018. Click here to read about the blessing of Fr. Cardona’s chalice and paten. 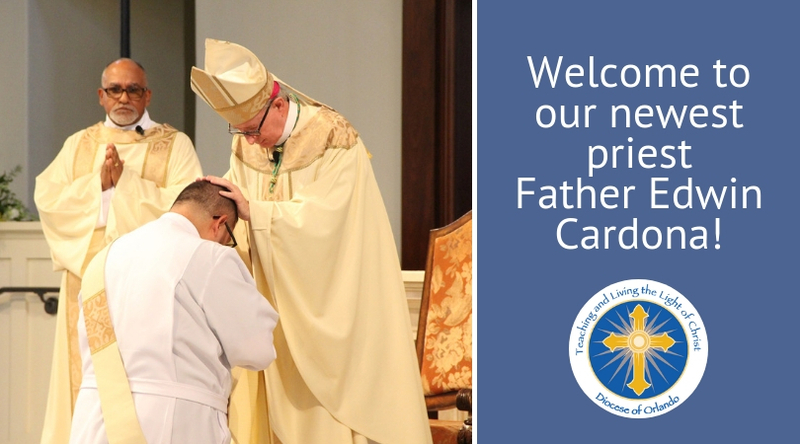 Click here for a gallery of images from his ordination on September 6 at Corpus Christi Catholic Church in Celebration.